Join Naomi Malone, Historian and Gallery Createability intern to discover how important drawing was in the creative and artmaking process for Brett Whiteley. 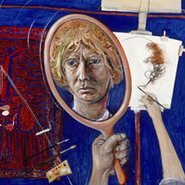 This tour will explore why Brett Whiteley is regarded as one of the most prominent Australian artists of the 20th century. The Createability Internship Program is a partnership between Create NSW, the Department of Family and Community Services (FACS) and Accessible Arts to create opportunities across the arts, screen and cultural sectors for people with disability. The tour will be delivered in English and will be Auslan interpreted.